As of this writing there are more than 3 billion searches per month on YouTube in the United States alone. If you're not Video Blogging or starting to at least think about video Blogging you're missing a huge SEO opportunity. With the new annotation ability in Youtube and the ease of use of free Microsoft Movie Maker Software anyone can throw together a Video. Don't worry so much about the quality of the video, espcially in the beginning. Just make sure your content is worthy. As you create more and more video's your quality will improve. Setting, light, camera, software knowledge will all get better with experience. Just keep in mind that the best video's are how to video's or funny video's. If your video is boring or lame, no one is going to send it to someone else or recommend it. The whole idea is to get people to email your video links, or post them in forums or embed them in blogs. If your video is not worthy of that you're just wasting your time and taking up space in cyberspace. Just about every October we can count on Google making changes that make every SEO and webmaster run around like crazy people. When you know google commands over 63% of all internet searches you'd better be paying attention to where your traffic comes from. If you haven't yet heard of WolframAlpha.com it won't be long. Wolfram Alpha was launched in the spring of 2009 to be a Computational Knowledge Engine rather than a Search Engine. I won't bother regurgitating everything that has already been published about Stephen Wolfram's new "answer engine" but suffic it to say.. it's going to be as important to the web as Google is. Wolfram Alpha will compute the actual factual answers to specific questions unlike Google where you can ask sentences, Wolfram will not return an Index like structure of related sites. On the surface when you ask Google a question, sometimes your results "or answers" appear at the top of Google's results. So what's all the hoopla about Wolfram? The Hoopla is that WolframAlpha doesn't merely "look up" answers like Google. Wolfram "computes" them using a level of understanding and reasoning, as well as using vast amounts of data about the topic being asked about. So if for example you were considering selling Dog food and wanted to know some facts about dogs in the USA you could ask Wolfram about the number of dogs in the USA. If for example you enter a Domain Name (yours for example or in the image to the right we used Facebook.com). WolframAlpha.com will return all the Facts it can find about the domain name including page views, hits, rank etc. 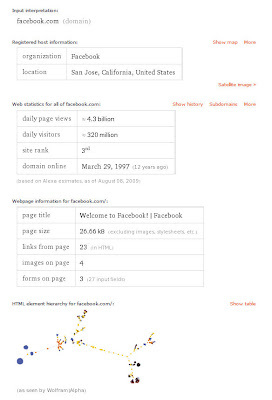 In our example; entering facebook.com in the search box returns the Registered host information, Web statistics for all of facebook.com, Webpage information for facebook.com, and the HTML element hierarchy for facebook.com. Why is this so important? Any Web Marketer needs to know how he/she fairs against the competition. Using this tool will give you a very good snapshot of how you stack up. Take a look at the HTML element hierarchy -- this can help you make sure your site is easily spidered by search engines. Going back to what can this do for you.. well, Wolfram Alpha is a system for computing the answers to questions. To accomplish this it uses built-in models of fields of knowledge, complete with data and algorithms, that represent real-world knowledge. Want to know what happended on your birthday? How about the Time difference from today since your birthday or notable events? Simply enter your birthdate in Wolfram. Find more examples of how powerful Wolfram is. WolframAlpha does not answer natural language queries, you have to ask questions using a particular syntax, or certain forms of abbreviated notation. For a complete Introduction and video tutorial of how this amazing new tool can help you, visit the wolframalfa.com introduction.